A feature of the English landscape is the small woodlands, of various types, scattered widely over the countryside. They are valuable assets for timber production, wildlife, game conservation, amenity use and in terms of landscape value. But a significant proportion of this resource is not in planned management. In 2011 the Forestry Commission estimated that almost 500,000 ha, or around 45 per cent of the total woodland area in England is un- or under-managed. This demonstration seeks to provide information for the timber management of small woods, emphasising ways and means of implementing small-scale harvesting techniques and equipment. 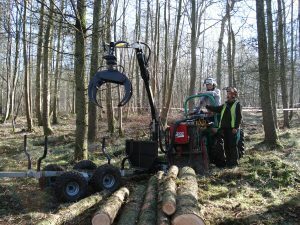 Exhibitors will be showing a range of smaller-scale equipment and techniques to unlock the potential of farm or small woodlands. It will help you to see how you can get the most out of your woodlands; give advice about small woodland produce, including woodfuel and consider how low-impact, silvicultural interventions may help make your smaller woodlands more productive. This event is being funded and co-organised by the Forestry Commission, Yorkshire Dales National Park Authority and the Nidderdale Area of Outstanding Natural Beauty.